I spend quite a bit of time on the internet writing about baseball over at Aerys Sports. I cover the Orioles and Stanford’s college team and occasionally add commentary on the Red Sox (and cover things when Mets writers can’t). So naturally, I love it when my beloved comedians love baseball as much as I do, and quite a few did. That being said, there’s Joe E. Brown, who actually played baseball, and that’s more than enough to get me to sit up and be really excited and want to know more. 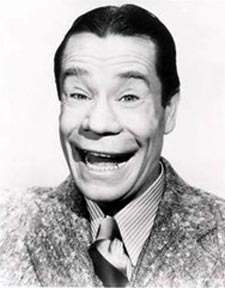 Joe E. Brown is best known for having a really, really large mouth (no, seriously) and yelling in a very specific way. All of his comedy’s clean, so you can share it with your kids if you’d like to. What interests me, though, is his baseball career – he played semi-pro ball and actually turned down a chance to sign with the Yankees to continue on with comedy. His son, Joe L. Brown, eventually became the GM of the Pittsburgh Pirates, so baseball runs in the family. Joe E. used quite a bit of baseball in his routines and even made three baseball-themed movies (which fans refer to as the ‘Baseball Trilogy’). Naturally, I was curious about the man’s actual baseball career, so I did what any good sportswriter does these days and went straight to Baseball-Reference. No stats at all, go figure. Back when he was playing, semi-pro players’ stats really didn’t capture the attention of anybody except the scouts who signed them to go pro. That means I’ll have to actually do some digging. I’ve added the man’s biography to my Amazon Wish List with plans to purchase it as soon as I can – and I do need to know important things – like what position the man played, for instance – in order to write the script for chapter 3 of Comedian Heaven. (That may be a giveaway about what that’s going to be about, but since I’m writing this it’s only inevitable that there’s a baseball chapter at some point.) It’s easy to find information about his comedy career (see here and here, for example), but his baseball career is eluding me at the moment, and as someone who considers herself a good researcher (I’m an archivist in training) and a pretty darn good sportswriter, I’m miffed that I haven’t been able to find anything yet. I guess the best thing to do is just keep going.